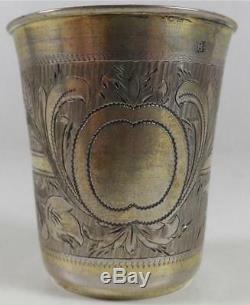 RUSSIAN RUSSIA STERLING SILVER 84 GOBLET CUP GILDED HAND ENGRAVED TURKISH WAR 1876. It is gilded inside and hand engraved on the outside. It has a beautiful magnificent pattern of flowers and stems. There are many hallmarks on the bottom of silver grade, maker and date. This cup is an old antique goblet from the year 1876. There is a hallmark on the rim of 84. During the period of the Russian Turkish war. Top diameter: 2 1/4 inches or 58 mm. Height: 3 inches or 75 mm. Bottom diameter: 2 1/4 inches or 42 mm. Weight: 65 g or 2.29 ounces. Please see pictures for more details. Please see my other items. Item came from old estate. Please see my store - Russian art Antiques. The item "RUSSIAN RUSSIA STERLING SILVER 84 GOBLET GILDED CUP ENGRAVED TURKISH WAR 1876 RU" is in sale since Thursday, April 4, 2013. This item is in the category "Antiques\Silver\Sterling Silver (.